During the 15th century there was considerable growth in church building. Windows were made much larger than before with increasingly refined tracery (the delicate interlaced stonework that divided the window into smaller areas in which stained glass could be inset). This development not only brought glass painters more business but also allowed them greater freedom in their compositions. Figure subjects such as this were ideally shaped to fill the pointed arches of the topmost lights in a window. 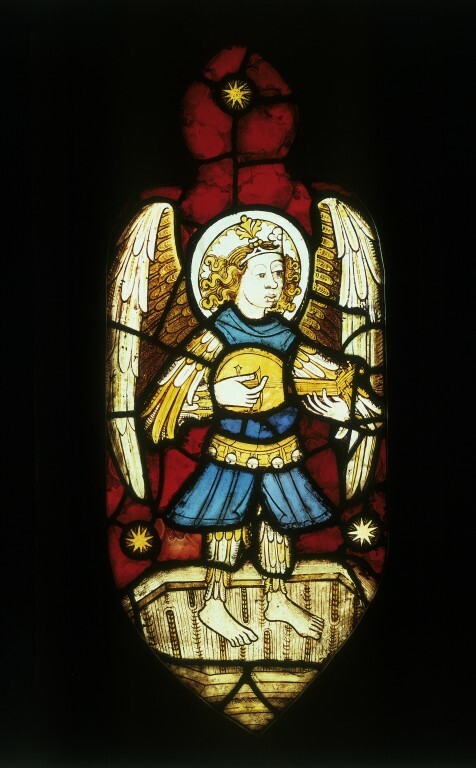 This panel depicts a feathered angel playing a lute - a motif thought to be derived from medieval mystery plays. These vernacular dramas, which enacted biblical tales such as the Creation and the story of Adam and Eve, were performed all over Europe in the Middle Ages. In England, guilds of performers toured the countryside with their 'pageant wagons', the actors playing angels wearing 'pyjama suits' covered with feathers. 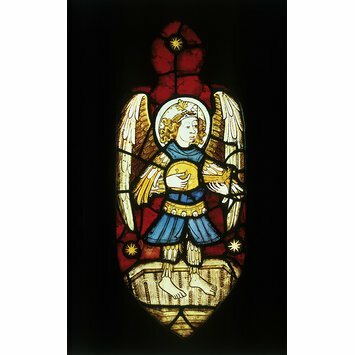 This panel is attributed to the Norwich School, one of the three major glass-painting centres in England that developed a distinctive style in the period. Stained glass was produced here from at least the 13th century. It was in the 15th century that business really took off, however, with many commissions financed by merchants made rich by the wool trade. Norwich glass was inventive, well drawn and vigorous in style. Its painters developed several motifs that were used with such regularity as to almost constitute trademarks. The most recognisable of these, featured here, is the pattern used to symbolise the grain and knotting of wood which resembles ears of barley. Panel, with a trefoil top, from a tracery light set in a clear modern panel. A crowned lute-playing angel, with a belt of bills, and feathered legs, painted in black and yellow stain, on a ruby ground spangled with 3 stars.